Rachel Maddow To Return To Her Show Tonight - Joe.My.God. MSNBC’s Rachel Maddow says she will be returning to her show Tuesday night after being absent since May 25. “I’ll be back on the air tonight — 9pm ET MSNBC. 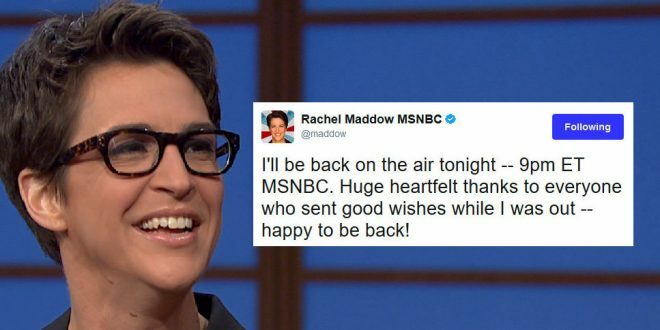 Huge heartfelt thanks to everyone who sent good wishes while I was out — happy to be back!” wrote Maddow. MSNBC on Tuesday announced its coverage plans for former FBI Director James Comey highly anticipated Senate testimony Thursday. Maddow, the network’s biggest star, was noticeably absent from the network’s on-air roster. “MSNBC’s coverage of the hearing starts at 9 a.m. ET / 6 a.m. PT with Brian Williams joined by NBC News’ Nicolle Wallace and a slate of expert guests beginning at 9:30 a.m. ET / 6:30 a.m. PT,” reads a release from the network. I’ll be back on the air tonight — 9pm ET MSNBC. Huge heartfelt thanks to everyone who sent good wishes while I was out — happy to be back!